When Shayna Garner told her sister Aimee that she would be her surrogate, Aimee didn’t speak for a moment. After eight unsuccessful rounds of IVF, Aimee and her husband were still coming to terms with the idea that they would never be parents. Shayna’s offer came as a surprise. Aimee was born with Hirschprung’s Disease, a congenital gastrointestinal disease. Over her life, Aimee has had around 40 surgeries which have left her with significant internal scarring, notably to the area around her reproductive organs. After four years of IVF that began when Aimee was 21, and two miscarriages including one of twins at nine weeks, surgeons discovered that Aimee’s scar tissue was preventing her uterus from expanding to carry a baby. Because Aimee had already been going through IVF, she had three viable embryos left in storage. The first transfer to Shayna was unsuccessful, but the second worked, and at the six week scan the overwhelming reality that they’d be parents struck Aimee and husband Jake. Aimee was in the room with her through most of her labour, and Jake and Shayna’s husband Aaron joined them for the birth. Seven months on, Aimee is a natural at motherhood, and baby Francesca is thriving. 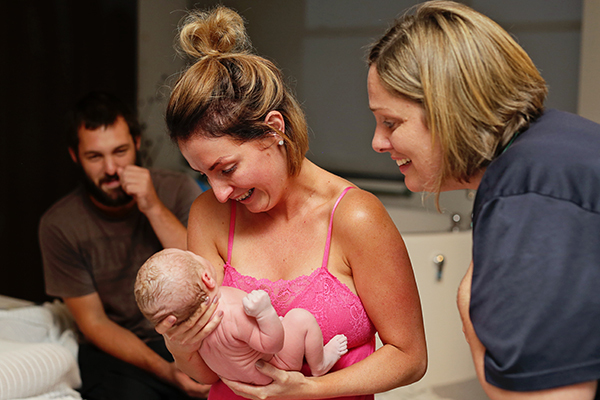 Aimee and Jake moved to Toowoomba to be near Shayna during her pregnancy, and the sisters now live 10 minutes apart. This beautiful video celebrates the birth of gorgeous Francesca. Warning: Tissue alert!